This beautifully-constructed video was posted on YouTube today. It shows very well how to assemble and finish an Archer Airguns "Classic" Silent Pellet Trap Kit. As you can see, the author added his own touches, including a Duct Seal shelf and handle similar to those featured in our "Premium" Trap. Here's an interesting website to view! 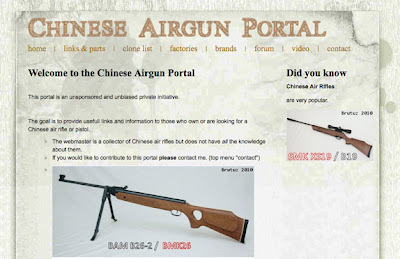 The "Chinese Airgun Portal" gives much useful information, including links to the Chinese airgun manufacturers' own web sites. This should help resolve some of the confusion about which factory makes what product - although not necessarily where you see the same gun featured on multiple factory sites. Also included is a useful list of "clones", both where one design copies another and where the same gun is known by several different names, eg QB78 = Tech Force TF78 = SMK XS78. 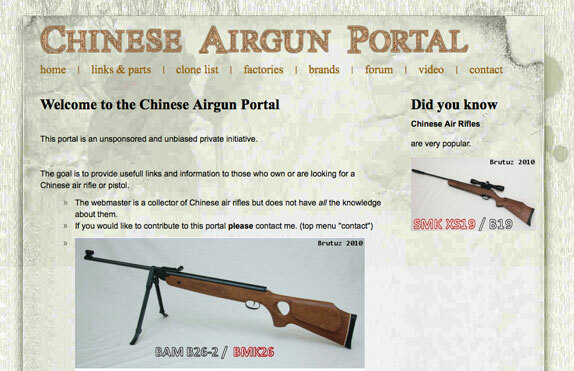 Another page provides links of vendors for both US and European (primarily UK) sources of parts, accessories etc for Chinese air rifles. Take a look, there's a lot to read! Thanks to "Brutuz", the site owner, for providing permission to make this post about his site. He's open to more information, so please contact him via the instructions on his site if you have material to add. Up-date on 11 May. We now have a solution to this problem. 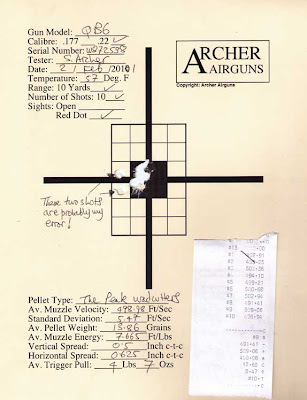 The Archer Airguns Universal Bulk Fill Cap works with any QB78 family air rifle, including those with the 10mm vent hole location that caused the problem outlined in this post. Over the past couple of weeks, we have received a (fortunately) small number of customer complaints about “leaking Bulk Fill Caps”. Thanks to the help of these customers, I’ve been able to identify the cause of the problem and it seems appropriate to share it here. The problem is actually NOT due to bulk fill caps leaking. The cause is, in fact, due to a manufacturing change in positioning of the tiny gas vent hole in the main tube of the gun. This vent hole is the one at the front of the main tube, within the threaded section of the tube, that releases any remaining gas when the tube cap is removed. The location of this vent hole has varied over the years - some guns have had no vent hole at all - but has typically been about 2.5mm from the end of the tube. However, the most recent guns now have that vent hole about 10mm from the end of the tube. It is this change which has caused the problem. 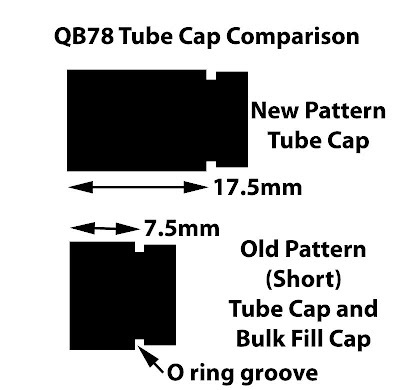 As you can see from the diagram below, the current long Tube Cap has the O ring slot about 18mm from the outer end of the cap. This means that the O ring in that position will ensure gas tightness in the main tube, irrespective of the vent hole being 2.5mm or 10mm from the end. But the Industry Brand Bulk Fill End Cap has the groove for its sealing O ring centred only about 7.5mm from the outer end (the same dimension as the old, short, Tube Cap). Due to manufacturing tolerances in O rings and their grooves, these figures are rather approximate. This means that it works fine with vent holes 2.5mm from the end of the tube, but where the vent hole is 10mm from the end, it MAY not - hence the leaking from some guns when using bulk fill. This effectively means that guns with the vent hole 10mm from the end of the main tube cannot be guaranteed to be capable of bulk filling using the standard Industry Brand Bulk Fill End Cap. As far as I can determine, guns with the re-positioned vent holes have serial numbers of about 106XXXXX and above. The guns affected can be AR2078, AR2078A, QB78 Deluxe and QB78 models. Current guns in the US supply chain mostly have serial numbers in the 096XXXXX and 106XXXXX series. I strongly suspect that this issue will also be found on the “OEM branded” versions of the QB78 such as the Tech Force and SMK models. I am making this issue known so that QB78 family users - and particularly potential purchasers - understand that the latest guns may not be capable of bulk filling. The QB78 HDD Pays For Itself in Six Tins of Pellets! Hammer debouncers are an accessory with a number of advantages, including improved muzzle velocity consistency (due to reduced evaporative cooling and consequent better pressure stability), quieter muzzle-blast, and reduced hammer vibration. But one that's not often mentioned is this. They may be the only accessory that can pay for itself. Here's an example for the QB78 HDD. I did a little math on the economics of CO2 "gas mileage," and came up with the following intriguing result for QB78 family air rifles that have had the Archer Airguns XP Tune Kit installed. Typically, shot count per fill of CO2 runs about 35 good shots with the XP Tune kit in place. Adding the HDD improves the number of good shots by over 40% with no impact on muzzle velocity, thus adding approximately 15 additional shots per fill. I looked up prices for Powerlets, and found that a typical cost for Powerlets (Pyramydair boxes of 25 - not counting shipping) is $0.60 each, so that it costs 2 x $0.60 = $1.20 to recharge a QB78. At 35 good shots per fill in an undebounced XP-fitted QB78, that works out to $1.20 / 35 = $0.034 worth of gas per shot. The "free" extra 15 shots per fill provided by the HDD are therefore worth 15 x $0.034 = $0.514 per fill. Thus, the HDD will pay for itself in saved gas in $27.99 / $0.514 = 54.5 fills. That works out to a free HDD in 54.5 fills x 50 shots/fill = 2723 shots = less than six tins of pellets! Yes, I know that we're not offering the QB6 folding stock air rifle with "Gold Service", but I couldn't resist doing a quick test on one of these interesting pellet guns. And I'm sure that one of our customers will not be to unhappy to find his/her gun was tested for free! 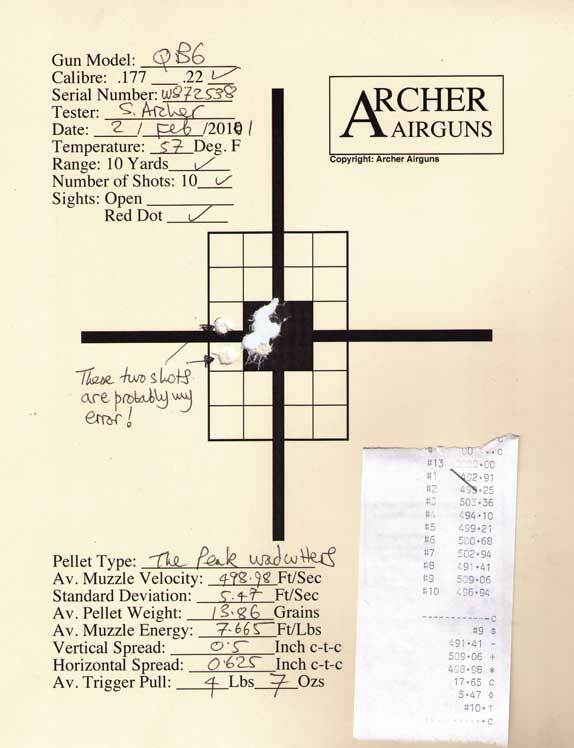 Muzzle velocity was right around 500fps - as you can see. 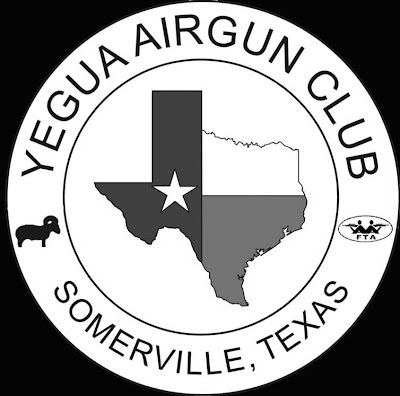 This is what I'm finding typical for the .22 caliber versions. The standard deviation of only 5.47 fps did surprise me, however, as this is extremely good consistency for ANY spring-powered air rifle "straight out of the box". And trigger pull came in well under 5lbs which, again, I feel is good performance at this price. There's nothing wrong with this QB6!